Despite plans at the start of this century to build a line up Ben Nevis, Scotland only ever had one real mountain railway. It ran from Dalmunzie House, at Spittal of Glenshee, to a lodge in Glen Lochsie and was used to ferry stalkers and their ghillies on to the grouse moors and deer forests. 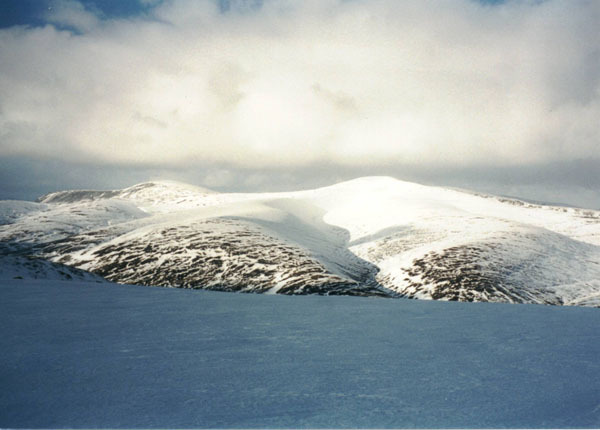 The line is now gone but the trackbed is still obvious and forms part of this route up Glas Tulaichean (a 1051 metre high Munro) from Spittal of Glenshee. Follow the access road up to the Dalmunzie House Hotel and stick with it as it skirts round the right hand side of the impressive baronial mansion. Prominent notices along the way warn hillwalkers against parking on the driveway and if you do drive up to the hotel, seek permission before leaving your car there. Built in 1907 as a shooting lodge, Dalmunzie House replaced a ruined castle. The land was originally rented by Sir Archibald Birkmyre who made his money with the Greenock Rope Company. He bought the estate and considerably enlarged the house. It was Birkmyre who laid the railway in 1921 to bring stone down for the reconstruction work. The house sits in an apron of trees and in a field along the back edge of this you will find the first traces of the railway. Pick up the trackbed and follow it as it passes below Glenlochsie Farm and sets a course up the glen. Almost immediately relics of the line are to be found in the form of old concrete sleepers and small bridges spanning streams running down into the Glen Lochsie Burn. Beyond the farm, the railway is lost under a vehicle track but it is easily picked up again just before the track fords the river. Wooden buffers and an elevated piece of ground signal the start of a zig-zag section enabling the railway to gain height quickly. Head up the trackbed slope to the top set of buffers, then double-back and follow the line up the glen. The track climbs gradually and along the way old concrete and wooden sleepers studded with metal pins remain in place. Half way up, a substantial stone and metal girder bridge spans a deep gorge and stream. The track rises to ruined Glenlochsie Lodge. Hidden in the grass and heather there is a quaint little platform at the terminus of the line and a rickety old bridge provides a precarious crossing over the Allt Clais Mhor. The railway was retained after completion of Dalmunzie House and, when the lodge was built, it was used to transport the laird and his guests up the glen. Two 20hp petrol powered engines were used. The first, 'Dalmunzie', entered service in 1920 and she was joined by 'Glenlochsie', an identical vehicle, the following year. Tales abound of the rollercoaster ride they provided on the downhill run. The line closed in 1978 but the nameplates of the two locomotives are to be found in the hotel. Behind the lodge, a track rises over the hillside. It climbs on to the long southern shoulder of the mountain and, after a steep pull up over Breac reidh, flattens out for a mile or so. The trek is lengthy but the views are excellent and the target remains in sight all the way. When the track reaches its highest point, leave it and head right, following a line of fence posts to the summit and trig point. From the top, you can either descend back into Glen Lochsie by retracing your steps, or take in Carn an Righ which sits to the north west. This entails a steep descent north to a path skirting below Man nan Carn. Follow this into the col below the second Munro and climb to the summit over the open hillside slope. From Carn an Righ, walk to Loch nan Eun and descend into Gleann Taitneach, sticking to the northern side of the Allt Easgaidh. The steep descent gives way to a long track walk back to Spittal of Glenshee. Grading Upland expedition over exposed and fairly remote hillside suitable for fit and experienced hillwalkers prepared for a long day.